My campsite was a very short walk to the beach, so naturally when I woke up, we walked to the beach: a thick band of smooth rocks at the water’s edge. 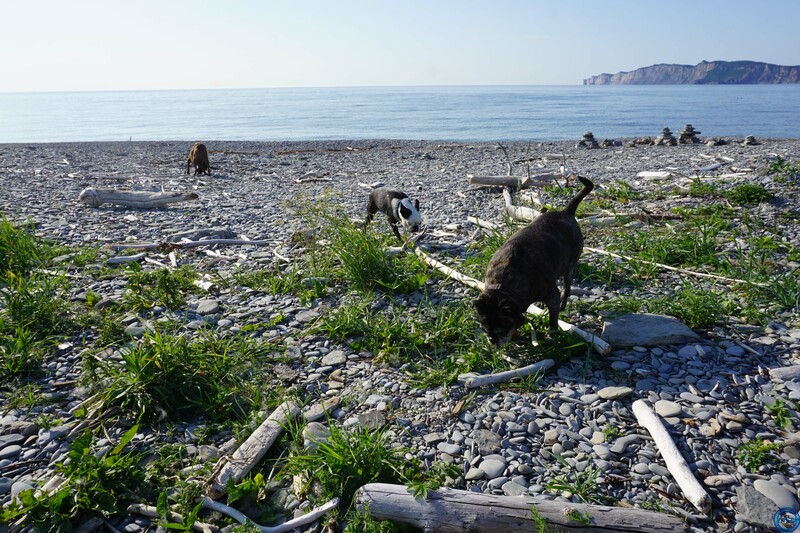 There was no one around us and no chance a porcupine could sneak up on us so I let the dogs play in the water. Once they tired of chasing waves, we headed back to camp and packed up. 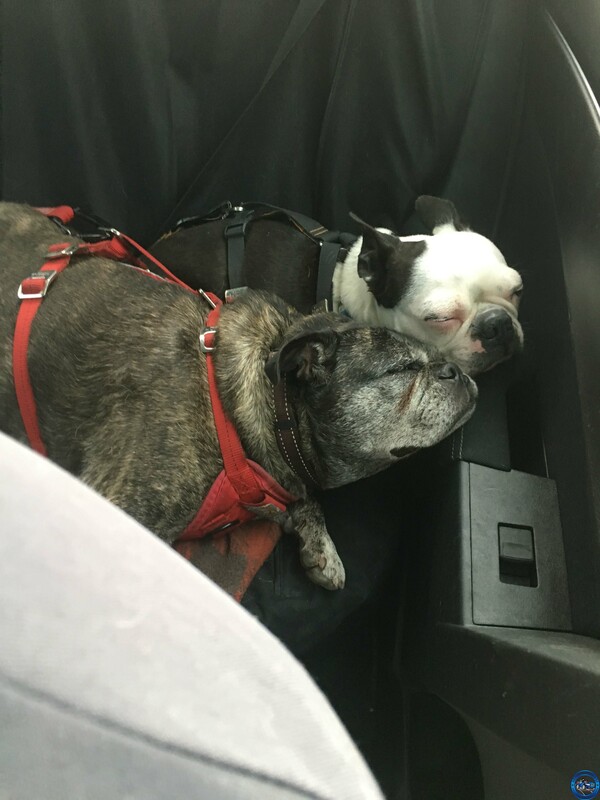 I think they were still tired from the hikes to Land’s End the day before, which is fine by me. We had the place all to ourselves. Watching the sun come up. On the way out, we passed the trail for La Chute Trail which the woman at the visitor center had said was her favourite trail in the park. The trail is not a difficult one and was shady, a real bonus in the growing heat of the day. It was a short hike which was the reason I choose to hike it on the way out and Les Graves the night before. We rounded a corner and saw a small waterfall spilling over moss-covered rocks. It was like a small oasis in the forest and we, ok me, took advantage of the chair placed at the bottom to immerse in the tranquility. Soon, three pairs of eyes staring at me got me off my hind end and back to the car. I stopped in the town of Gaspe for some breakfast. I found a cute little cafe called Cafe Des Artistes with a large patio outside. I should have known that there was going to be issues when I popped in to ask if I could sit on the patio with the dogs. There I was standing in front of several staff and no one spoke to me. One even looked at me, looked me right in the eye, and went back to folding napkins or something. I wanted to see how long I could stand there before someone acknowledged my presence and it was way too long. But I was there, the car was parked, and I just wanted a quick bite. I figured “what could go wrong?” Well my friends…just wait. After being told that I could sit outside with the dogs, I went with them and picked a table at the back of the seating area. I figured that way they wouldn’t bother anyone. Now I didn’t see a lot of staff on the patio so it took a little while to get a menu. I looked it over and when my server returned with my coffee, I ordered the croissant. She clarified which croissant I wanted and then left. You know when you lose track of time and then you suddenly realize you’ve been sitting there for close to an hour and no one has brought your food or checked on you? Yeah, that was how it went. I couldn’t go and get her because the dogs weren’t tied to anything sturdy and the people around me didn’t seem to like dogs too much. Finally I was able to wave her down and she seemed surprised that I hadn’t gotten my food. Well maybe if you had checked to see how things were you might have known. She scurried back before I could tell her to cancel my order. I had consumed coffee otherwise I would have just left. She came back and said that my food would be out in a few minutes. Well sure enough, a few minutes later, another staff member came out and slid a plate on my table almost without pausing. I looked down and realized it wasn’t what I had ordered but by this point I was too hungry and antsy to get going that I just ate it. The same server returned with a muffin and some fruit (and my bill) to make up for the mix up with my late food. The whole situation was so absurd that I started laughing and told him that what he had brought me wasn’t what I had ordered. He tried to say that maybe she didn’t understand what I ordered at which point, while still laughing, I told him that she had repeated it to me. And the absolute worst part of it all? It’s not the wrong order, it’s not the extreme delay in getting back on the road, or the fact that I still paid for it. It’s the fact that the food was on the high end of mediocre. It was just meh. Never mind that. To the car! 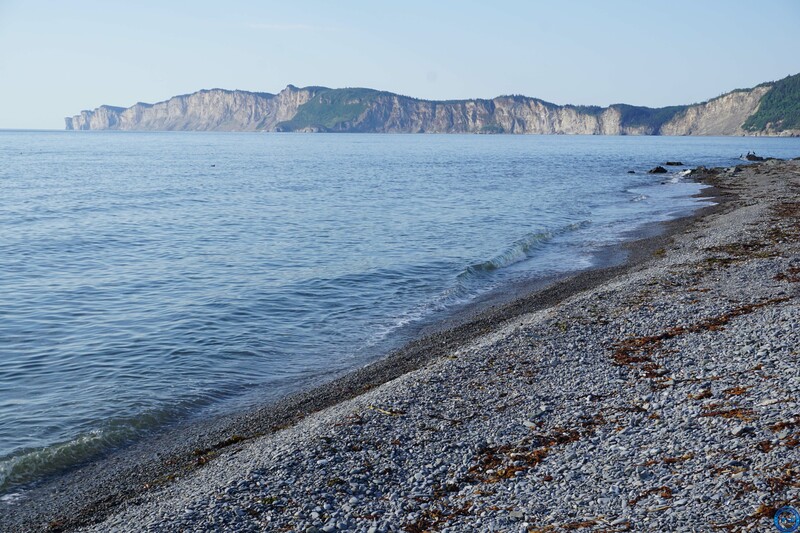 We drove off on sunny roads, leaving Gaspe far behind. And then we hit another torrential downpour. The kind of downpour that makes you wonder why you’re still driving. The kind of downpour that tests the high speed on your wipers. The kind of downpour that makes you turn the radio down so you can think better. Yeah that kind of a downpour. 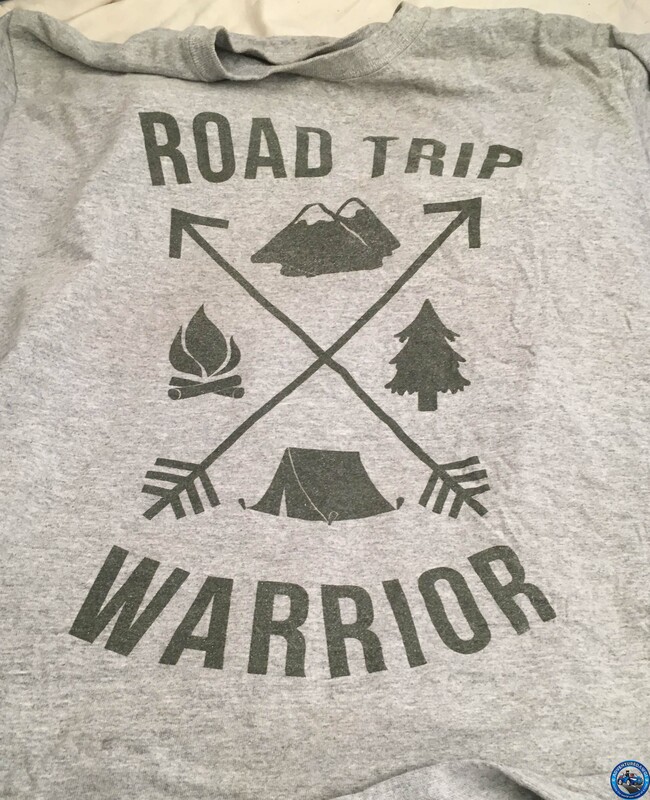 My hopes of camping in our next park seemed to be fading…just like the rain….HEEEEEEEEEEEY there’s the sun again. Almost like magic, the ground seemed to absorb the rain and we weren’t walking in mud flats that I expected when I let the dogs out for a walk. So camping was still an option tonight. We continued on, enjoying the scenery and a little sad that we had missed so much of it in the rain. 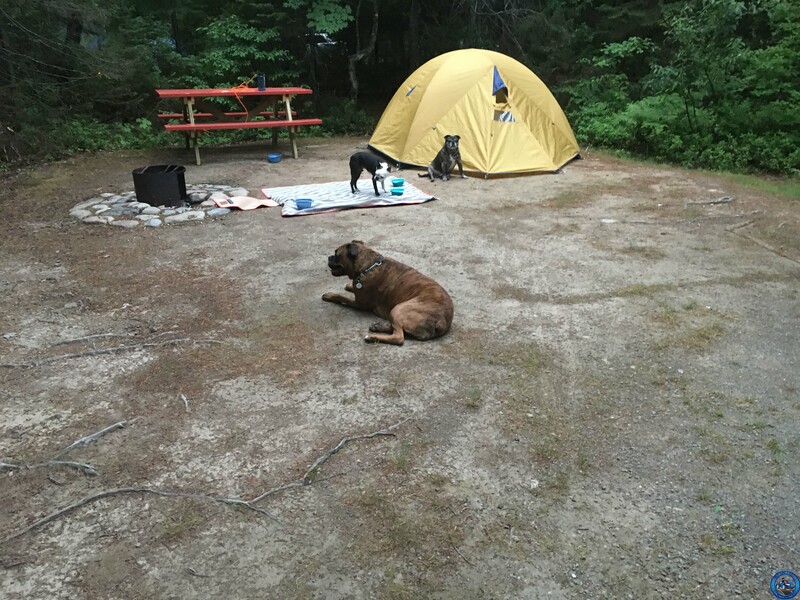 When we arrived at Kouchibouguac National Park (pronounced KOO-she-boo-gwack) in New Brunswick, we quickly got set up in another large campsite and set out for a walk. Partly to explore the area and partly to get away from the noisy neighbours that seemed to make the most of their “outdoor voices”. 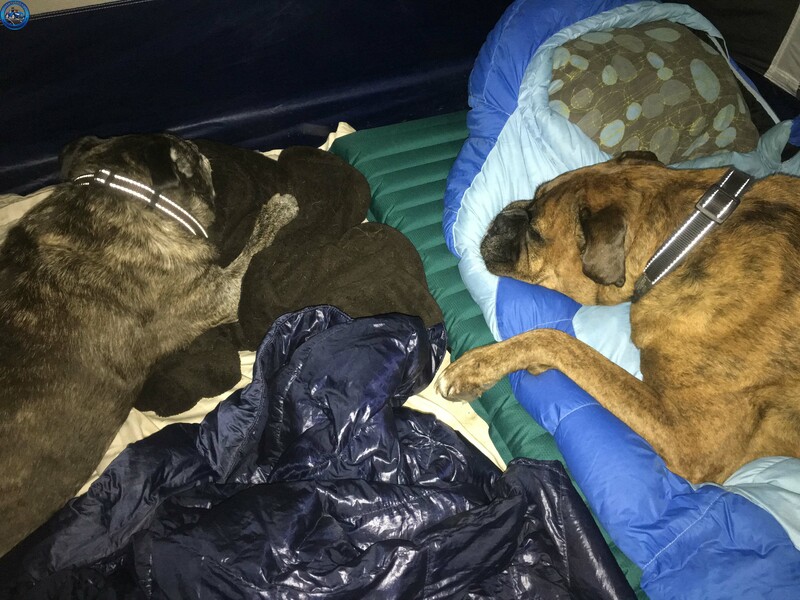 We walked a trail along the water but as the shore was really muddy, and I didn’t want muddy puppy paws in the tent, the dogs didn’t go for a swim. But oh the looks I got when I wouldn’t let them in water! That over the shoulder “are you kidding me?” I got from Jack especially pointed. Well there was little doubt how he felt. We also had the first mosquitos of the trip. I was shocked that it took so long to get bitten seeing as how I pretty much lose a pint of blood just walking out my door at home. Thank you to my sister in law for jinxing us with that. That’s only a portion of our site. HUUUUGE. 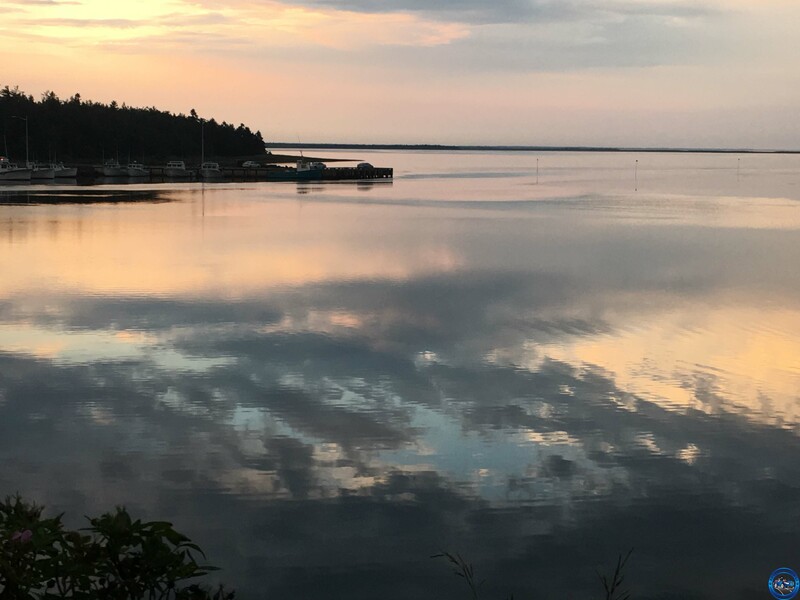 From what we saw, Kouchibouguac appeared to be much flatter and low-lying which would explain the mosquitos. This would also make it a bit more child-friendly since there wasn’t the same exposure to the open ocean as dunes stretch along the east side of the park and provide a buffer for the shore. With the leg-stretch and exploratory walk out of the way, we went back to the site and everyone got covered with some bug juice. I have a bottle of repellent for the dogs called “Bush Stomp”. It seems to help a bit but they don’t like it and will lick it off. 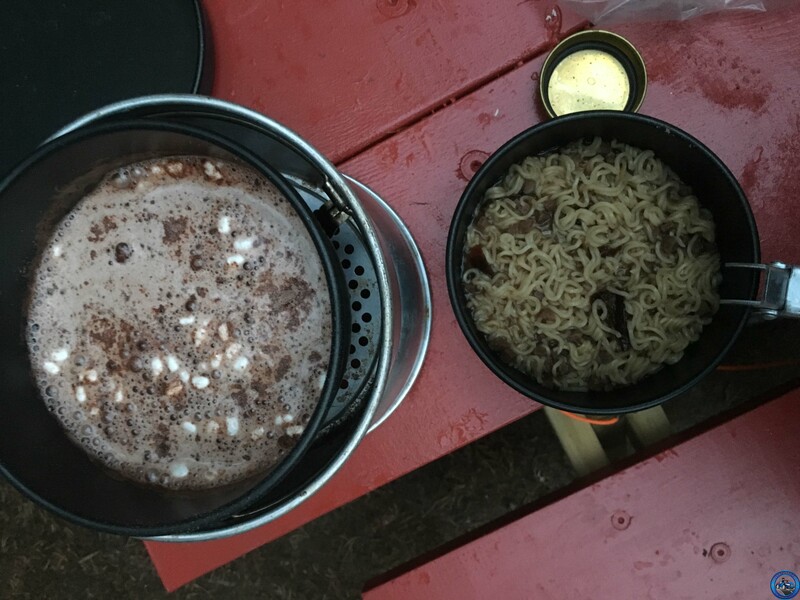 By this point, I was STARVING so I dipped into my food stores and whipped up a pack of ramen noodles with dried tomatoes and beef which I washed down with some whiskey-spiked hot chocolate. It’s not fancy food but it’s still better than the breakfast I had. And I had smiles all around me. No doubt hoping I would drop something. Then we all piled into the tent. I had to not so gently nudge Piper off my sleeping bag, since she has the ability to pass out while I’m taking off my shoes and zipping the tent up. If you’re driving from the north, Route 117 will take you into and through the park and if you’re driving from the south, Routes 11 and 134 connect with Route 117 near the visitor centre. From the number of bikes I saw, I would say that it is the activity in the park. The trails are wide and flat and lend themselves to being explored on two wheels. I also saw plenty of canoes and small boats. 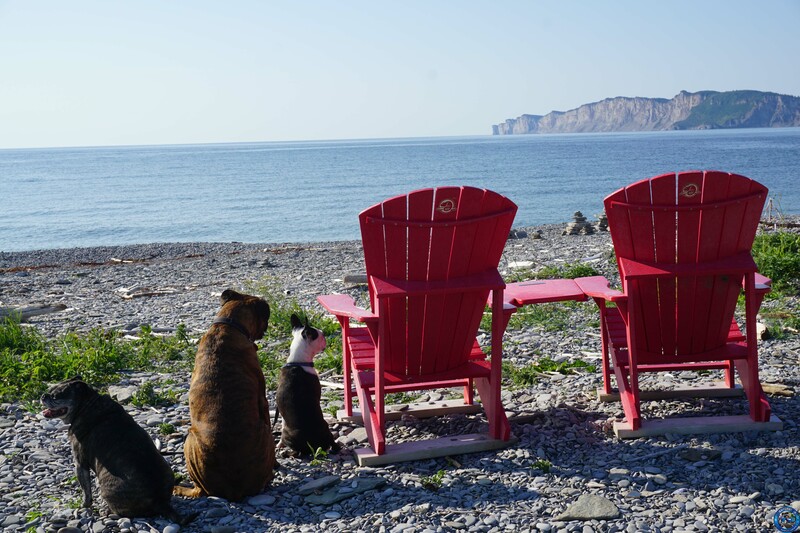 At 238 sq km, it is a smaller park but there are still plenty of trails and beaches to explore. The park has serviced and unserviced campsites and group tenting. There is a restaurant and a canteen in the park. I did not eat at either so I can’t comment on the food. 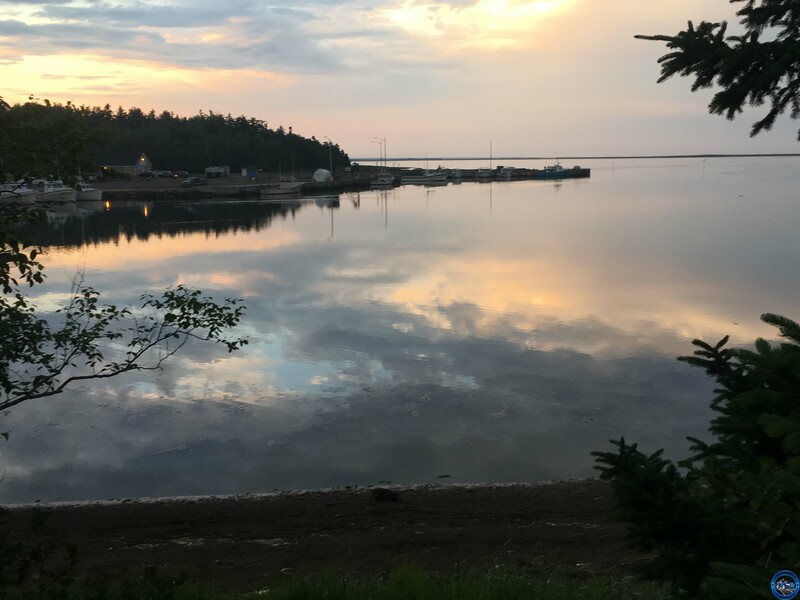 There are several towns less than 20 kms from the park and Miramichi is 50 km away while Moncton is a short 105 km drive so there are plenty of options for food. 7 response to "An Oasis and More Rain"
Fabulous images. Although I think the cretins at that cafe did deserve a real tongue lashing-sheesh! 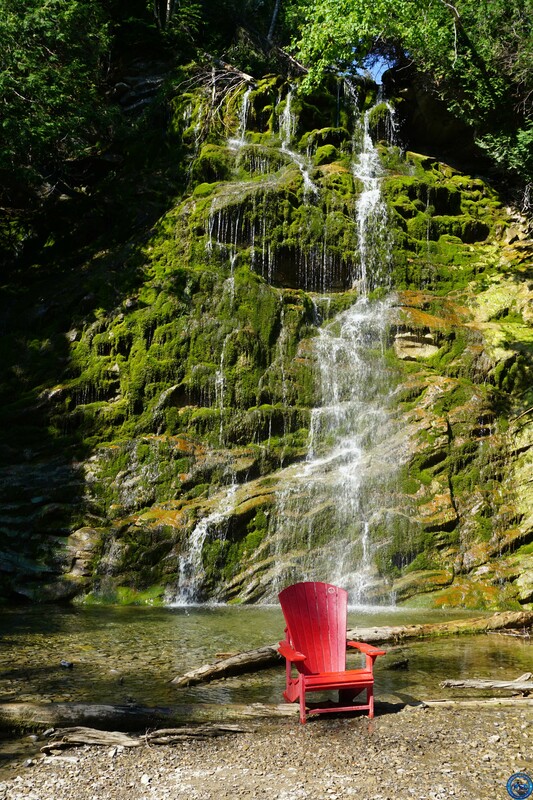 I was especially fond of the red chair at the falls. Then those skies above the water…pure visual paradise. Thank you. If I was planning on returning I likely would have gone on a bit more of a verbal rampage. Those falls were a wonderful surprise and I totally understand why it would be a favourite trail. Oh my, what a frustrating experience at the café. Hilarious too. Pleased to see you use a decent sleeping mat. Frustrating doesn’t even begin to describe it. And yes I am all about sleeping comfort. Apparently Piper is too. Great photos but our favorite was “watching the sun come up”.